The Sterling saw some demand last week on new hopes that Brexit could be extended past March 29. Yesterday however, seven Labour MPs quit the party in a major blow for leader Jeremy Corbyn causing the pound to drop. Meanwhile, the EU reiterated that the Brexit withdrawal agreement is not open to negotiations adding more pessimism. Looking ahead, the UK will release its latest Employment data seen steady at 4.0%, along with the Average Earnings Index. A better than expected data might help bring back the recent bullish momentum on the pair. 1.2930 (R1) so far is proving to be a strong resistance line. The Pound couldn’t break above it in yesterday’s slow session falling back later in the session towards 1.2900. Today the bulls will try to retest 1.2930 (R1). A break above it could take the price towards 1.30 (R2) for a retest. 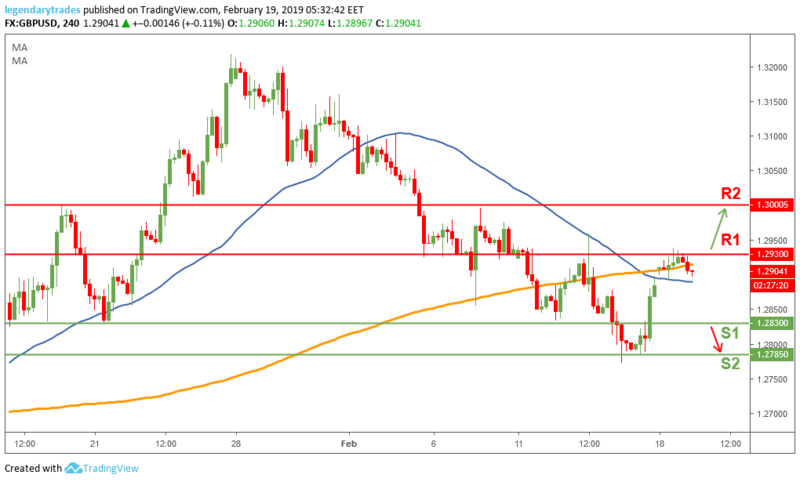 If the Sterling breaks below 1.2900, then the bulls will most likely lose this short-term upward momentum and price will fall back towards 1.2830.